Delta Shower Systems offer so many great benefits it's no wonder they have become the industry standard. 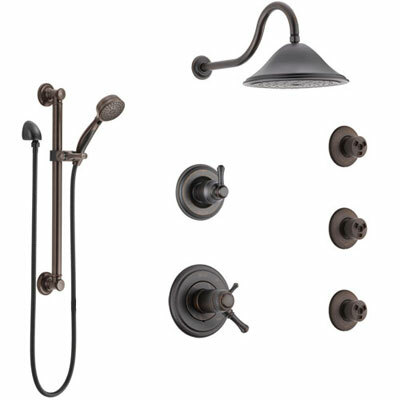 A luxury spa style Shower System experience is a great way to wake up in the morning. 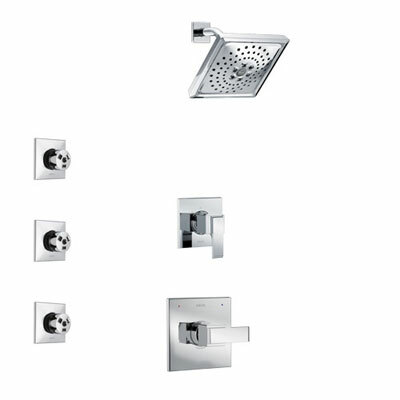 Delta Body Spray Shower Systems come in a variety of configurations, styles, and finishes. 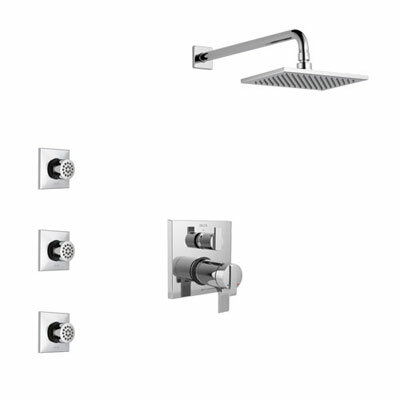 Whether you want a multi head shower, shower body jets, or a hand shower at FaucetList.com we have the shower system for you! This article will focus on Shower Body Spray Wall Jets, specifically Shower Systems with Delta's new HydraChoice Body Sprays. In the article you will find some images of these body sprays in action. There's also a video that will help you imagine your Shower System after you install a set of HydraChoice Shower Wall Jets. 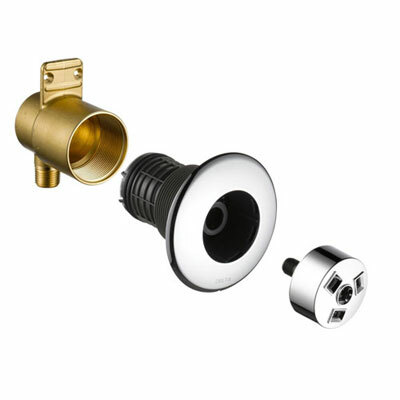 Body Sprays / Wall Jets are a key component of most high-end Shower Systems. 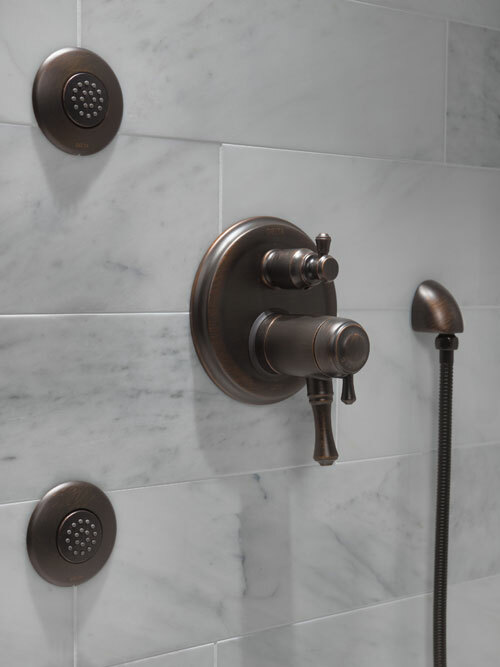 Shower Jets install on the wall and offer a truly luxurious experience. Never be cold in your shower again! In a multi jet shower you will be completely surrounded with warm water. 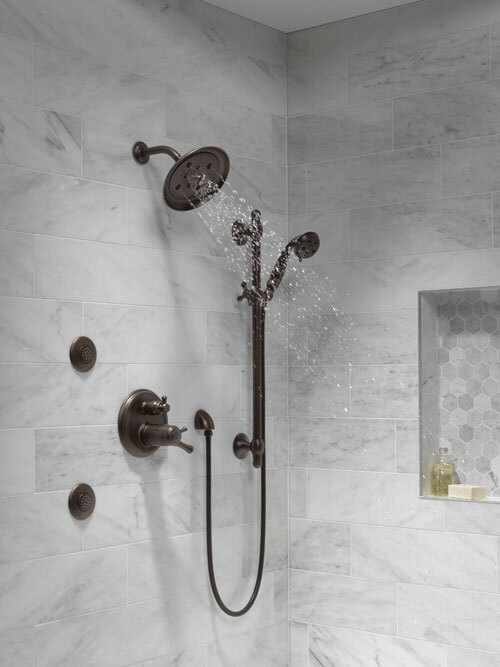 As wonderful as a full body shower system is, it can be difficult to figure out exactly what you need to purchase to make your dream shower a reality. 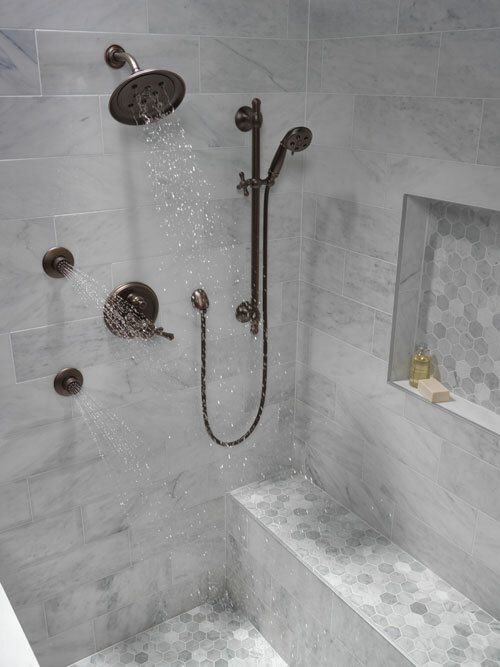 We receive tons of questions from people who are confused about exactly what parts they need in order to create a custom shower in their own home. 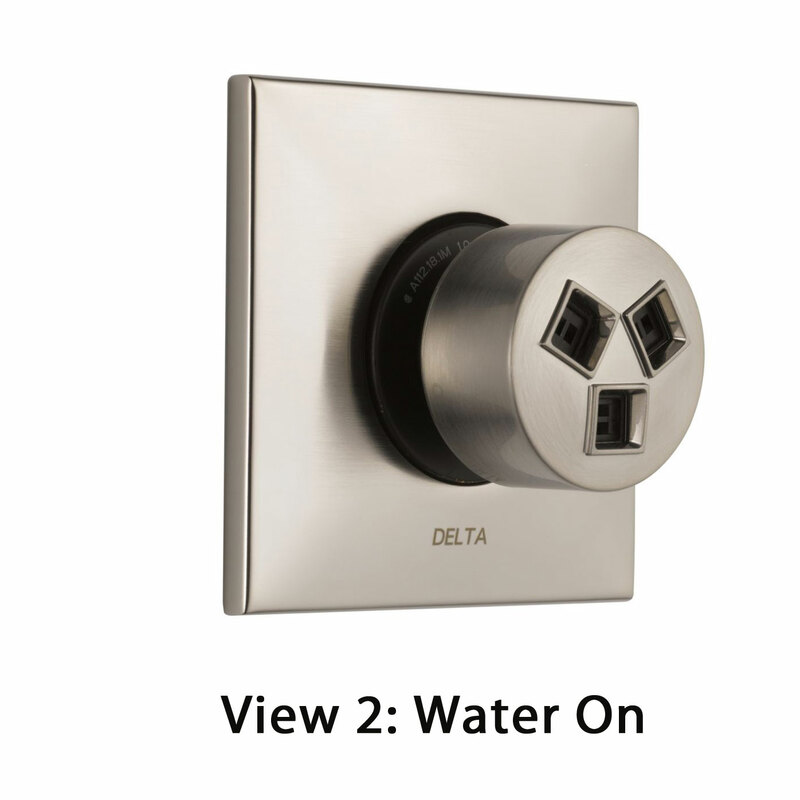 These questions inspired us to write our Guide to Delta Shower Systems. 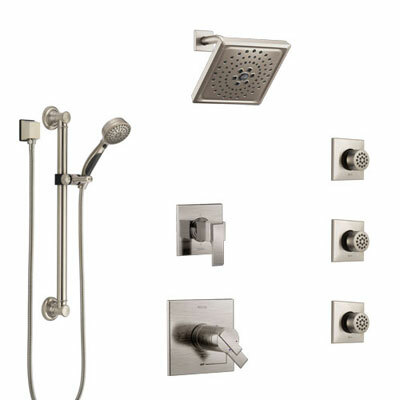 Check it out if you want a ton of great information on Shower Systems. Keep reading for more information on shower systems and body sprays. 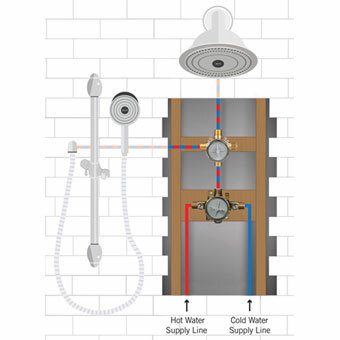 Good Information about Shower Systems is hard to come by! When searching this topic you will find a lot websites claiming to teach you about custom showers and body sprays. However, not all of that information is written by people with actual experience. Other sites often hire content writers who don't have real plumbing experience to write about these issues. It's no surprise that their guides are not always completely correct or nearly as helpful as you'd wish. Often the guides on other sites are confusing because the person writing the guide is actually confused about the topic themselves. At FaucetList.com we have over 40 years' experience in the plumbing industry. We have worked with all the top brands and have a wealth of knowledge about Shower Systems. We use our Buying Guides as a way to help share this information. Ultimately it is our goal help you make an informed buying decision. When you are researching custom shower systems you likely have considered whether or not you want Body Sprays. 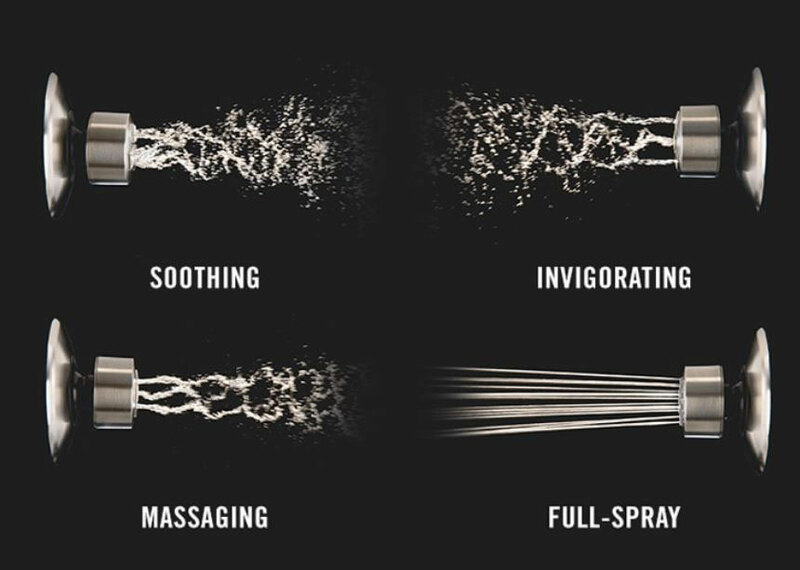 Body Sprays are one of the several peripheral shower spray options you can choose from when designing your Shower System. 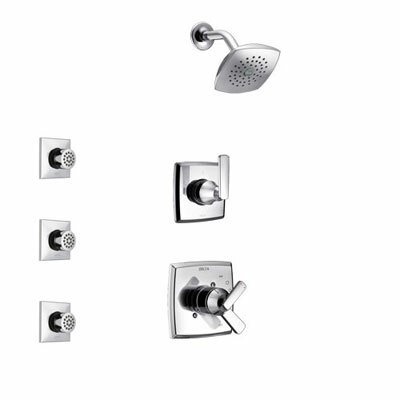 Along with Ceiling Mount Rain Showerheads, Regular Wall Showerheads, and Hand Shower Sprays, Body Sprays are a common part of many shower systems. A Full Body Spray Shower System is something many people would love to have. 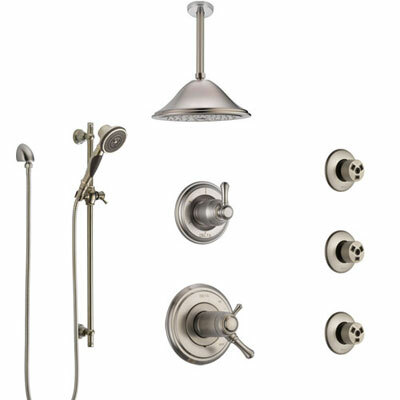 To enjoy a Spa style Custom Shower System in the privacy and comfort of your home is a true luxury. 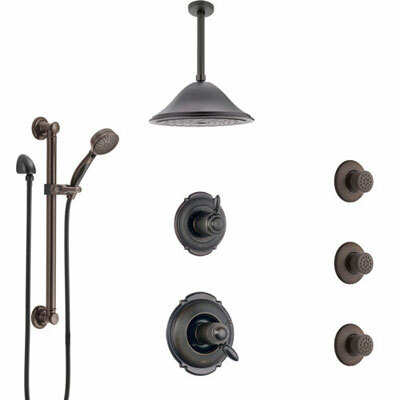 Shower Systems have become an essential part of any true master bathroom design. We know that when you begin researching this topic, it's not necessary clear what Shower Body Jets are or how exactly they are installed. Some of this is because there's a lot terminology / lingo that is industry specific. Those of us who work with plumbing all day often accidentally drop terms that a normal person would not be familiar with. In this guide we try to describe everything you need to know about Shower Systems with Body Sprays. So what exactly makes body sprays different from showerheads? It's actually pretty simple. 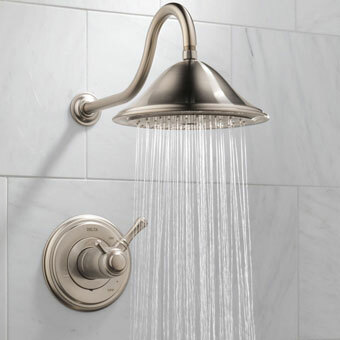 Most people know what a Showerhead is. 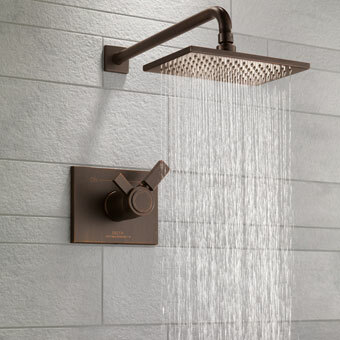 A Showerhead comes out of the wall above your head and rains / sprays water down on you. 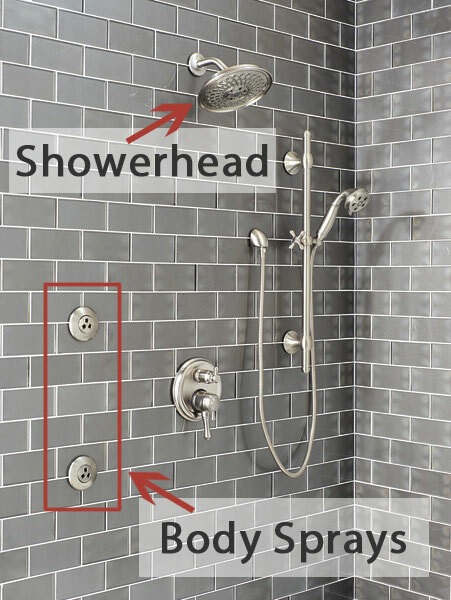 In a normal shower the showerhead is the only spray outlet. What makes Body spray jets different is that they come out from the wall at body height (i.e. below your head). Sometimes they are called wall body sprays and other times simply body jets. The terms are interchangeable. Basically anything that installs on a vertical wall in your shower and sprays water horizontally at your body is a Body Spray. 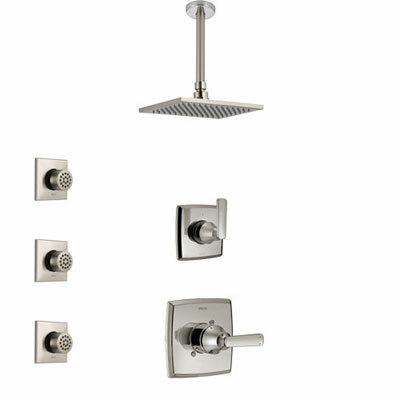 Typically Body Sprays are only found in custom shower systems where there are multiple spray outlets. Because shower body sprays are installed lower than standard showerheads your shower system will be able to fully engulf you in water. Body sprays make showering pleasant and warm by surrounding you with water. 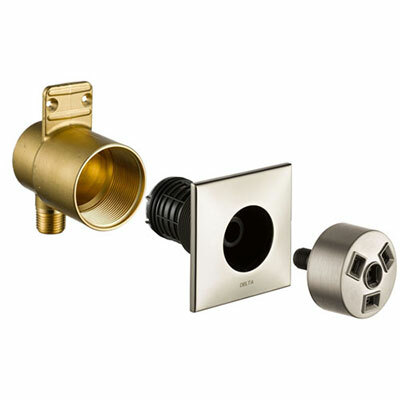 Typically Delta Shower Systems are installed with a multi-setting shower diverter. To pause the body spray jets while soaping up, you simply rotate the diverter handle. When you're ready to rinse, turn them back on! We often get asked: How do Delta HydraChoice Body Sprays work? It's actually a little challenging to explain in words. You kind of need to see what they are like installed to get an idea of what you are looking at. You should definitely check out the pictures and video below. The HydraChoice Body Jets are quite unlike any other wall sprays out there on the market today. See the image on the left for a breakdown of the component parts that make up a complete HydraChoice Wall Spray. The valve is the rough brass part that installs inside the wall and connects to the pipes. The trim kit installs on the tile and covers the hole in the wall. 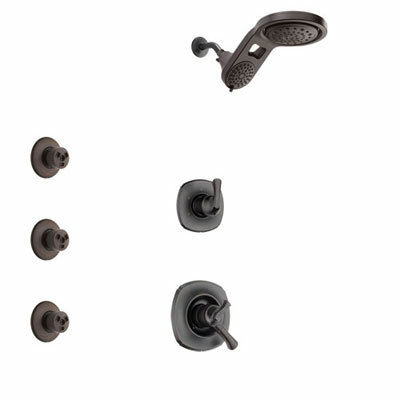 The trim provides a decorative, sleek, and finished look. The spray head is where the water actually comes out. This article will help explain the benefits a Shower system with Delta HydraChoice Shower Body Jets has to offer. They are super cool and many customers don't really understand what makes them special. Until you've seen the HydraChoice sprays in action it's hard to know what makes them better than other shower wall jets. We have included a video below to show their unique and futuristic water powered "pop-out" feature. This feature is not just about the "wow!" moment you'll have when you first see it. There's also a functional purpose for the design as well. 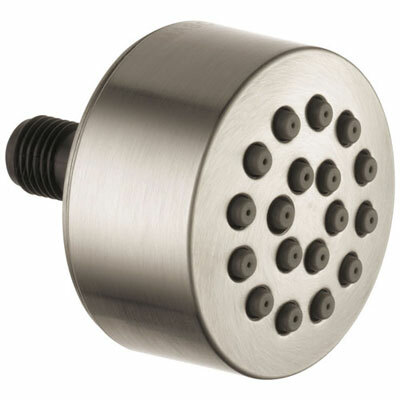 Shower Body Jets are a great addition to any Shower System. However, installing them requires a little bit of planning. Specifically you need to make sure you will have enough water pressure and enough hot water to take full advantage of all the benefits body sprays have to offer. 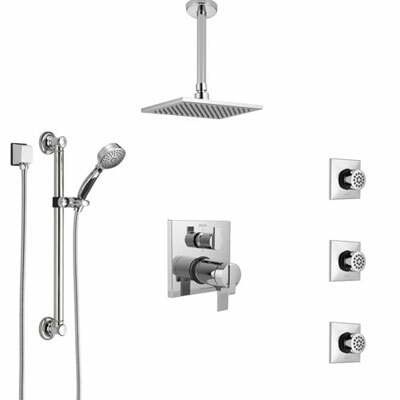 Remember to check our Shower System Guide for more information. A Full Body Spray Shower System will require you consider a few things. 1) How will you mix the hot and cold water? 2) Will you get enough water pressure from the mixing valve to power the shower system? 3) How will you divert the water to the peripheral spray outlets? 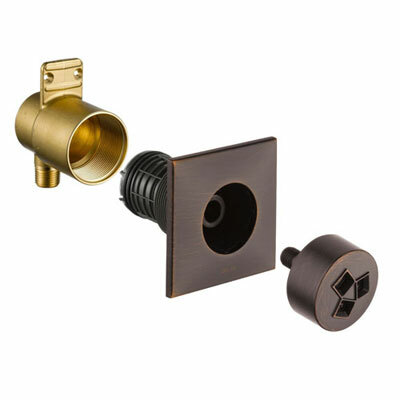 4) What peripheral spray outlets will your system have? 5) How many body sprays can you supply with adequate water? 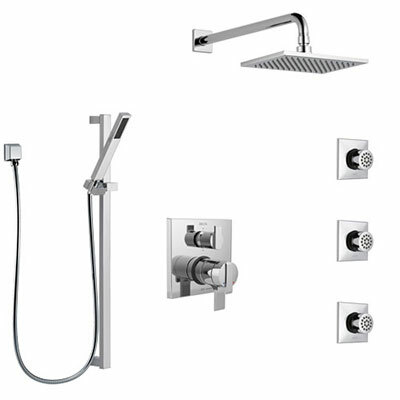 At FaucetList.com we have put together many pre-built Body Spray Jet Shower Systems that take into consideration all of these requirements. One additional aspect you will have to think about on your own is the capacity of your home's water heater. A Shower System outputs more water than a normal Shower Faucet. Therefore you need to make sure you have enough hot water to run the system, with all its peripheral sprays, for long enough to take a shower before the water getting cold! Your plumber will need to consult the Delta Body Spray rough in specs plus take into consideration your personal preferences when choosing where to install them on the wall. You will want to consider how far apart the wall jets should be to make sure you get full body spray coverage. You'll also want to make sure they are installed at a convenient height. Also, while body sprays don't necessarily have to go on the same wall as the other shower controls or spray outlets, you should make sure they are not installed so far away that the spray won't reach you! Spend some time thinking about your shower body spray layout so you end up with the optimal experience. When you get everything right, Jetted Showers provide a very enjoyable experience. In addition, having a shower system in your master bathroom has been shown to add value to your home! 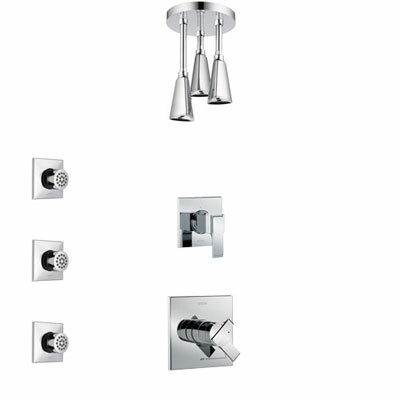 Once you've decided to invest in a luxury shower system you will begin to see that there tons of different styles. It can get overwhelming and become difficult to make a decision. 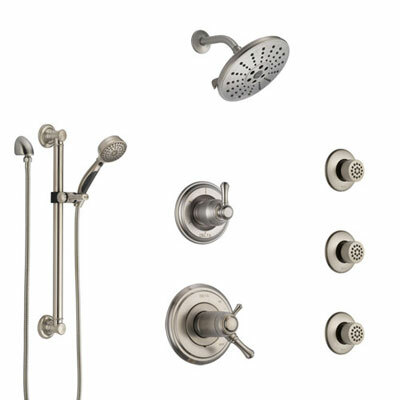 At FaucetList.com we have over 40 years of experience and we think that Delta Shower Systems are the best. At FaucetList.com we feel that Delta represents the best value in plumbing today. The quality of their fixtures is excellent and their price point is reasonable. 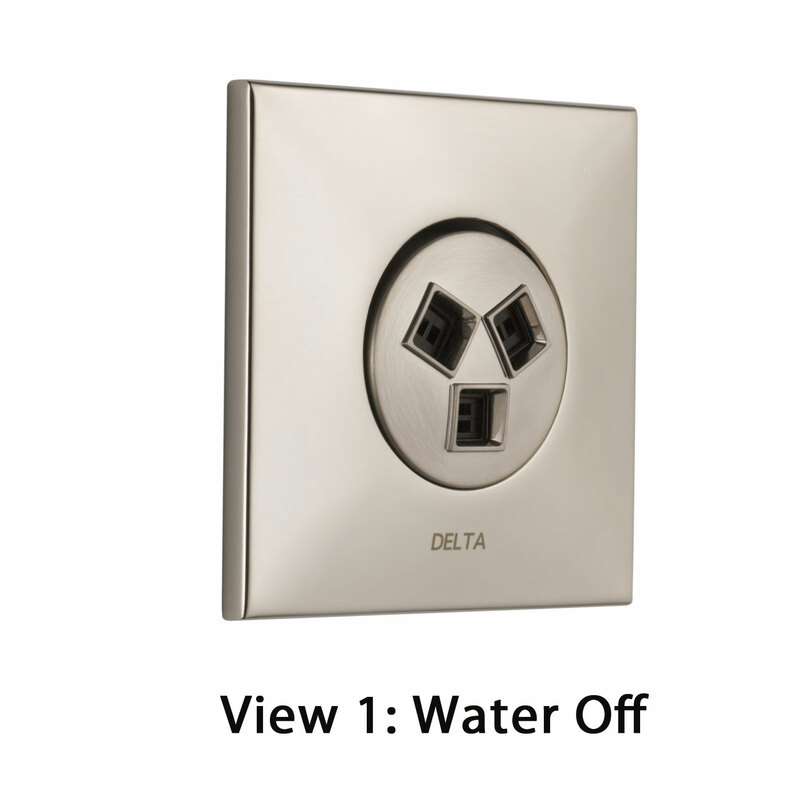 Delta provides a lifetime warranty not only on the product operation, but also on the product finish. 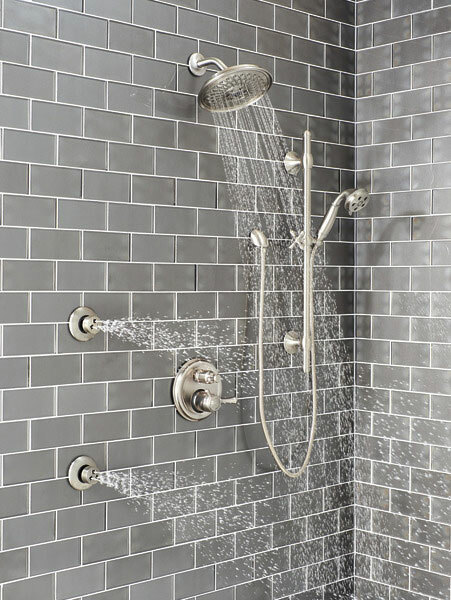 This alone should be enough to convince you to get a Delta Shower System. 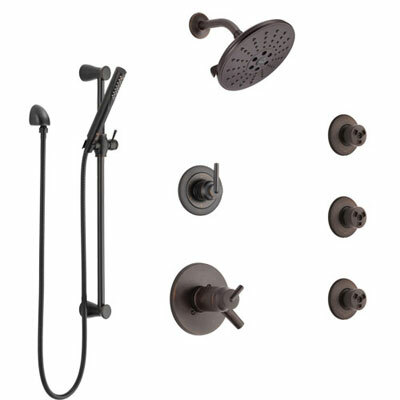 If you want your shower system to look great many years down the road then you can't ignore the significance of Delta's lifetime warranty on the product finish. It's actually quite a rare benefit. Most other manufacturers do not agree to cover the product finish under warranty. 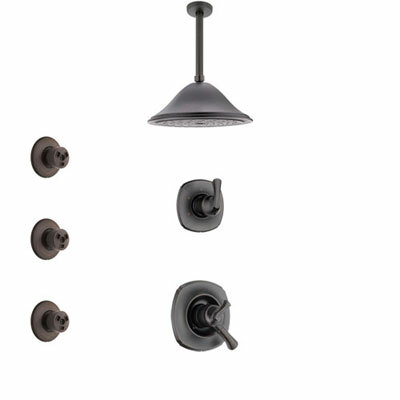 Delta's manufacturing process is so advanced it allows them to offer this warranty as they know their fixtures have a finish that will not fade or tarnish and is designed to last. 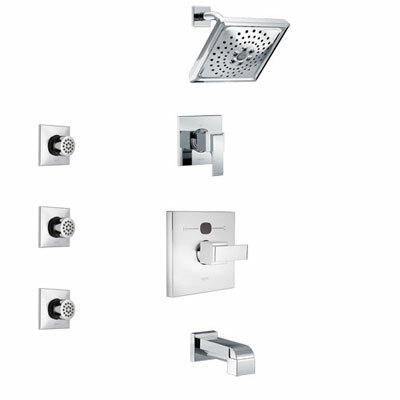 In addition, Delta is constantly innovating when it comes to the world of multi jet shower systems. The perfect example of this innovation can be found with the HydraChoice Body Spray Jets. What makes HydraChoice Body Sprays Different? Although HydraChoice Body Sprays are much like other body sprays, there are a few important features to point out. First and foremost, HydraChoice Body Sprays literally pop-out of the wall when you turn on the shower. You may be wondering: How do these Shower Body Jets work? Well it's actually rather simple. Using the pressure created from the water flowing through the pipes they go from being flush with the wall to sticking out and spraying. Watching them in action is positively futuristic! See the video below. The thing is, the HydraChoice body sprays don't pop-out this way just to be cool (although it is a pretty cool feature). There's another more important reason. This gives you the ability to angle the water. Many other manufacturers make Shower Jet Kits that install flush against the wall however they do not pop-out when in use like the Delta HydraChoice body sprays. A flush mount design really does look nice but you often have to sacrifice the ability to manually angle where the water sprays from each jet. Having the water simply spray out of a hole in the wall offers very little flexibility as to where it will actually go. You probably don't want the body jets to spray water in the exactly same place all the time. 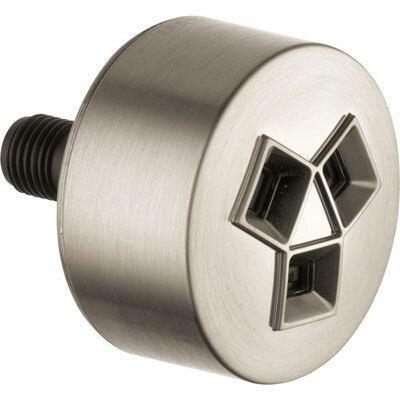 Depending on the height differences of people using the shower, the ability to angle the Body Jet Shower Heads can be essential. Delta's HydraChoice Body Sprays come out of the wall when they are turned on which allows you to adjust and angle them however you choose. If you are looking at body spray shower system reviews you will want to pay attention to whether or not people mention the ability to angle the jets. Some body sprays can't be aimed at all. Others can only be aimed up and down but not side to side. Delta HydraChoice Body Sprays have 50-degrees of adjustability in any direction, the pop-out body sprays can be angled to suit everyone, from the tallest person in the household to the shortest or even the seated. This is a pretty big deal. Shower systems with Body jets are much more useful and flexible if you can aim the spray heads wherever you like. How do the HydraChoice Body Spray Jets Retract? 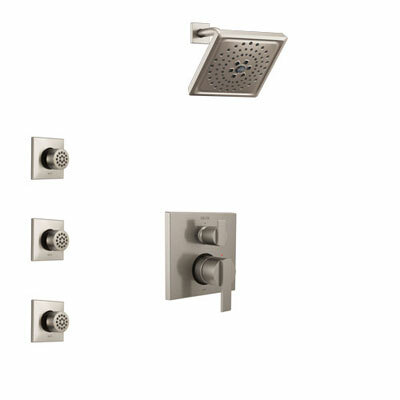 Delta HydraChoice body spray shower kits come out of the wall automatically but they do not retract automatically. This is because they function using only water power rather than electricity. When you shut off the water there is no power for the Body Sprays to retract automatically. This means you can leave them angled however you like and they will remain in place. 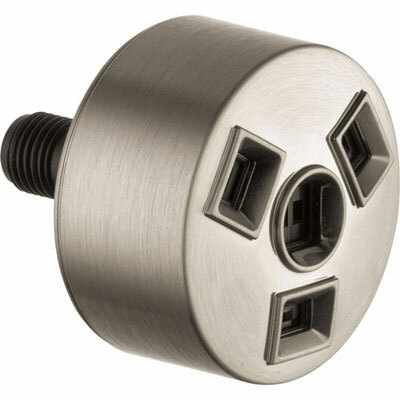 You can also choose to easily push the Sprayhead back into the wall. In doing so, the sprays will be out of the way and ready to use for next time (see just how easy this is in the video between seconds 28-34). This close-up view shows the body spray head in the "out" position. After your shower is done, a simple push will click the spray head back into place flush with the wall. This close-up view shows the shower body spray head pushed back in, flush with the wall. With just a very light touch and the spray head will lock back in place. Now that you understand a little more about the Wall Mounted Delta HydraChoice Body Spray Jets, watch the short video below to see them in action! This video is a little promotional in nature but it really does give a good idea of what a shower could be like with a set of Delta HydraChoice body sprays. You'll see just how cool they look coming out of the wall and get an idea about how the water spray pattern will look. You will also see how easy it is to click them back into place. Watch now! What you may have gathered from the video is that ordering HydraChoice body sprays is a little tricky. 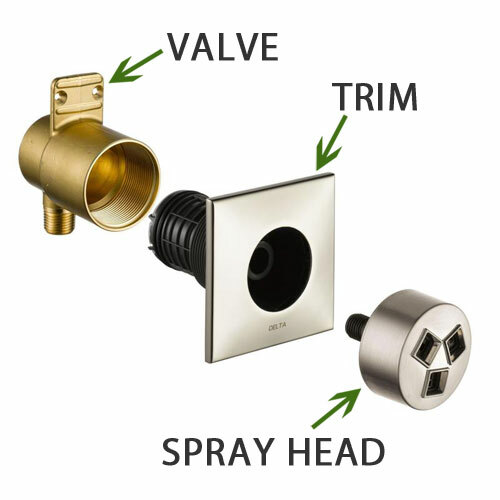 To make one complete body spray you need to order the valve (which installs in the wall), the trim which covers the hole, and the body spray head itself. We have put together packages that make ordering Delta HydraChoice Body Sprays easy! The body spray packages include everything you need for installation. 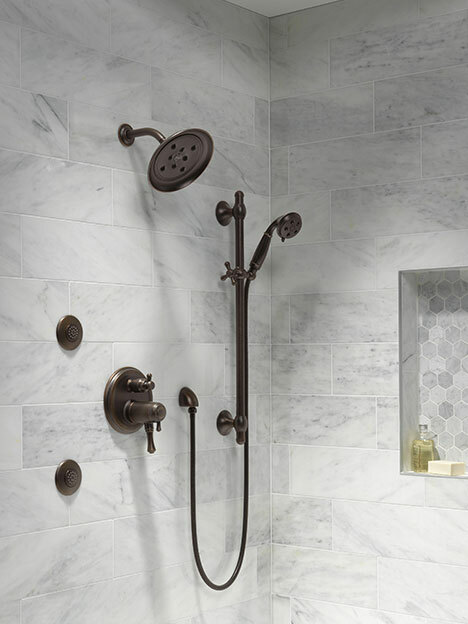 All you need to decide is the quantity you want your Custom Shower to have. You could even go a step further and simple order the whole custom shower system at once! Whatever you need we can help! Don't worry about the hassle of tracking down and ordering all the matching finish compatible pieces. Let us take out the guess work and make things easy! Get everything you need with just a few clicks. 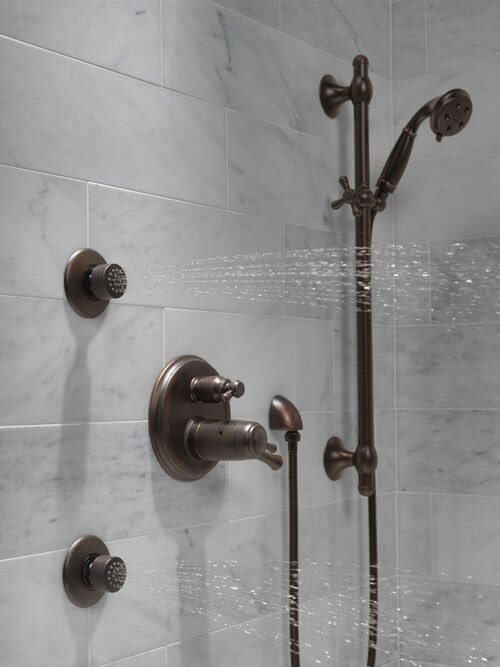 Spend your valuable time enjoying your Shower System rather than solving the difficulties of ordering. 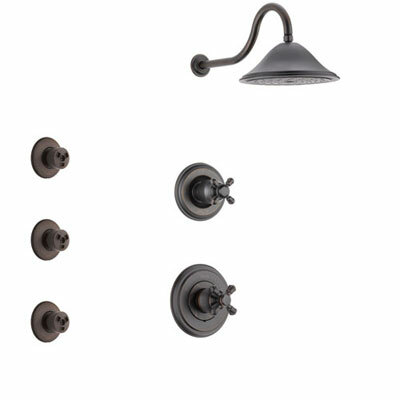 Order from FaucetList.com today! Delta HydraChoice Body Jet Sprays have 4 different spray head options. The difference has to do with the water pattern the spray is designed to create. Honestly the variation between the spray patterns isn't huge but it may be worth considering if you have some particular requirements. As the video explained, the ability to change the spray head easily without the need to remove the trim kit or valve from inside the wall is a great advantage. All HydraChoice body sprayheads are compatible with the same valve and trim kit. This means you can order without the worry that you will be stuck with something that isn't perfect. Soothing Spray Pattern: This is the least directed of the water spray options. The water is oscillated inside the soothing body spray head to create a full drenching effect. This is great if you want to get really soaked and warm but don't like high water pressure hitting you. Massaging Spray Pattern: The internal design of these Body Spray Heads forces the water out in stronger waves with greater force. When these waves hit you they have a pleasant massaging effect. This is great for people who like a stronger water pressure. Invigorating Spray Pattern: This Body Spray style is a sort of cross between the soothing and the massaging spray patterns. It has a more directed spray massaging spray in the middle but also offers some of warming/drenching effect provided by the soothing spray head. Full Spray Pattern: This is the easiest to understand as this style of body spray is the most straight forward. These Body Sprays have lots of small holes and a stream of water flows from each. This creates an effect similar to that of a normal showerhead. 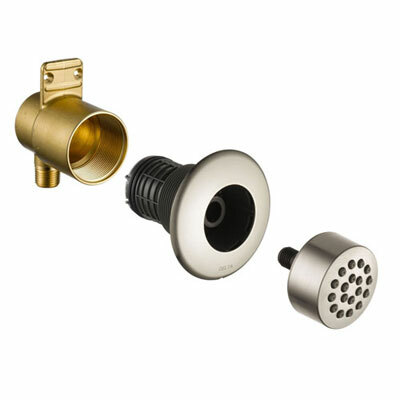 The water pressure of these sprayheads is largely determined by the water pressure in your home. So what does it take to build a Shower System with HydraChoice Body Sprays. 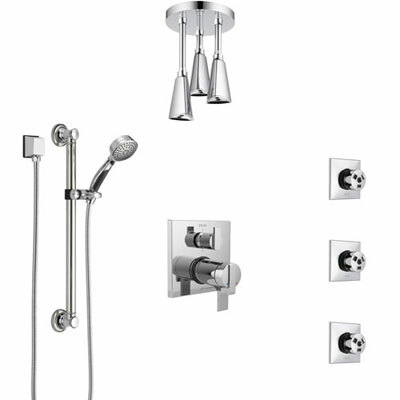 Well you should start by reading our Shower System Guide. 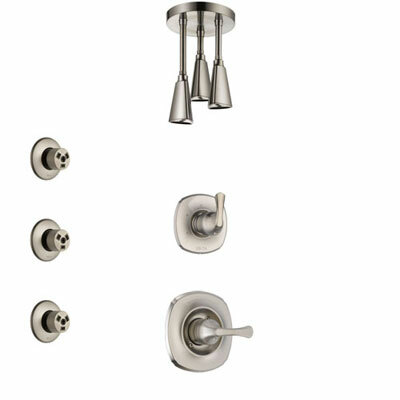 Instead of normal Delta Shower Jets you can order Shower System with Hydra Choice Body Sprays. It's reasonable to have between 2 and 4 HydraChoice body sprays running as a single peripheral spray outlet group. 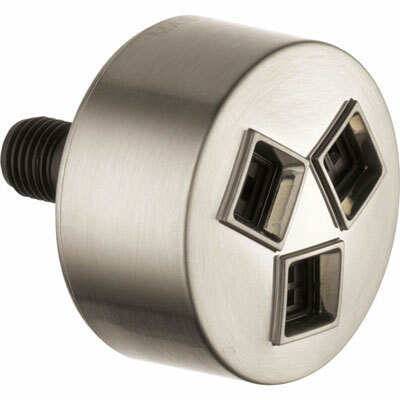 One of the reason's so many customer's don't order Delta Hydra Choice Shower Wall Jets is because of how complicated it can be to make sure you are ordering the correct, compatible items. 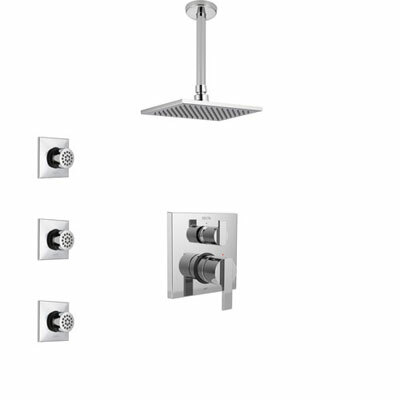 At FaucetList.com it is our goal to be the easiest place to order a Faucet - or in this case a multi jet shower! 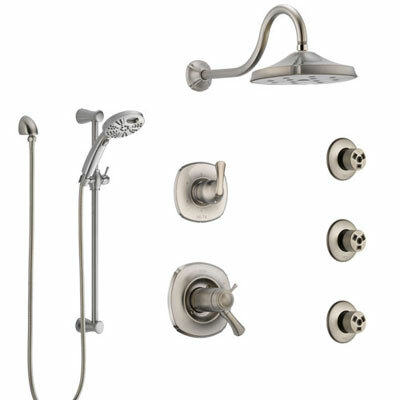 Take out the guess work of making sure everything in your multi head shower system is compatible. Order one of our pre-built shower systems! If you still want to build your own custom shower system at least let us help make ordering the Delta HydraChoice body sprays a little easier. We offer convenient to order packages that include all components. Guaranteed to match, guaranteed compatible, HydraChoice Jets can help you build the luxury Body Spray Shower of your dreams!